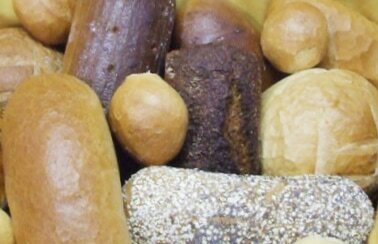 Bread is at the heart of many meals. Savory and comforting, bread is delicious as a part of a sandwich, on the side of an entrée, or as a simple snack on its own. Many bakeries do not bake the types of bread we do because the traditional techniques and high-quality ingredients are not the easy approach. 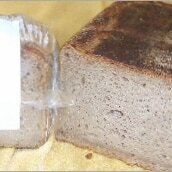 A natural rye bread made without any fats or sugars. 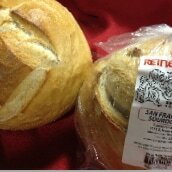 Our natural fermentation process gives this bread a wonderful sourdough flavor and helps maintain its moist texture. ​Ingredients: Rye flour, flour (wheat flour, malted barley flour, niacin, reduced iron, thiamin, mono nitrate, riboflavin, folic acid), rye flour, water, rye flakes, salt, yeast, caramel color, ground caraway seed. 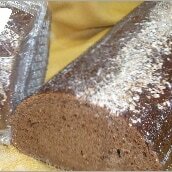 ​This Russian style pumpernickel bread is slightly less course than our other pumpernickels and has a higher rye content. 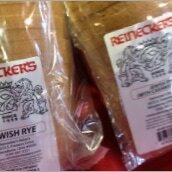 Topped with chopped rye for a distinctive look, this natural sourdough bread is perfect for Reuben sandwiches. ​Ingredients: Flour (wheat flour, malted barley flour, niacin, reduced iron, thiamin, mono nitrate, riboflavin, folic acid), rye flour, water, rye flakes, salt, yeast, caramel color, ground caraway seed. This 100% rye bread is by far the most sour sourdough bread. A strong sour flavor for the true sourdough enthusiast, without the use of fat and sugar. ​Ingredients: Rye flour, water, salt, yeast. 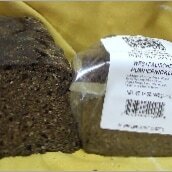 ​A delicious, high-fiber all natural sourdough pumpernickel. Derived from a 350 year old recipe, our exclusive natural fermentation process allows us to produce this bread without the use of sugar, fats, or preservatives. Ingredients: Rye flakes, flour (wheat flour, melted barley flour, niacin, reduced iron, thiamin, mono nitrate, riboflavin, folic acid), rye flour, water, salt, yeast, ground caraway seeds. This bread evolved out of our very own Volkornbrot. We add caramel color to give it a slightly sweet/sour flavor and dark color. ​Ingredients: Rye flakes, flour (wheat flour, malted barley flour, niacin, reduced iron, thiamin, mono nitrate, riboflavin, folic acid), rye flour, water, caramel color, salt, yeast, ground caraway seed. 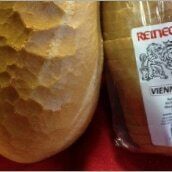 ​The formula for this natural sourdough bread originated in the famous German city of Cologne. It has a slightly higher rye to wheat ratio (75 - 25). It contains less than 1% salt and is absolutely sugar and fat free. Ingredients: Rye flakes, flour (wheat flour, malted barley flour, niacin, reduced iron, thiamin, mono nitrate, riboflavin, folic acid), water, salt, yeast. 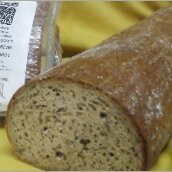 ​This bread gets its unique flavor from natural Minnesota frown flaxseed. High in fiber, low in salt, and sugar and fat free, yet moist and flavorful. 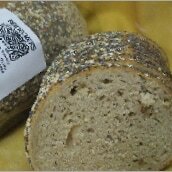 ​Ingredients: Water, whole wheat flour, rye flakes, flour (wheat flour, malted barley flour, niacin, reduced iron, thiamin, mono nitrate, riboflavin, folic acid), flaxseeds, salt, yeast. A blend of ten different grains give this sourdough bread a wonderful texture and taste. It's not only good for you, but is also good tasting. ​Ingredients: Whole wheat flour, rye flakes, water, flour (wheat flour, malted barley flour, niacin, reduced iron, thiamin, mono nitrate, riboflavin, folic acid), seseme seeds, rye flour, sunflower seeds, rolled oats, cornmeal, barley flakes, millet, slat, yeast, malt, caraway seeds. : Whole wheat flour, rye flakes, water, flour (wheat flour, malted barley flour, niacin, reduced iron, thiamin, mono nitrate, riboflavin, folic acid), seseme seeds, rye flour, sunflower seeds, rolled oats, cornmeal, barley flakes, millet, slat, yeast, malt, caraway seeds. For the sunflower seed lover, this sourdough bread is packed full of crunchy sunflower seeds. ​Ingredients: Flour (wheat flour, malted barley flour, niacin, reduced iron, thiamin, mono nitrate, riboflavin, folic acid), rye flour, barley flakes, cracked wheat, water, salt, yeast, sugar, soybean oil, honey, ascorbic acid, enzymes, spice oils (tumeric, paprika), natural colorant, sesame seeds, ground caraway seed. A crossbreed between our Volkornbrot and our Kolner Sauerteigbrot with a twist. Hickory smoke flavor gives this bread its very distinct flavor. 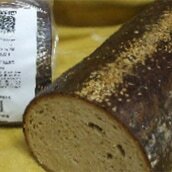 ​Ingredients: Hickory smoked flavor bread - flour (wheat flour, malted barley flour, niacin, reduced iron, thiamin, mono nitrate, riboflavin, folic acid), rye flour, rye flakes, water, liquid hickory smoke flavor (water, natural hickory smoke concentrate), salt, yeast, caramel color, ground caraway seeds. If you love grains, you will love this bread. It contains thirteen different grains. To top it off, the harvest bread is rolled in a combination of sesame seed, millet, flaxseed, rolled oats, poppy seeds, and caraway seeds. ​Ingredients: Flour (wheat flour, malted barley four, niacin, reduced iron, thiamin, mono nitrate, riboflavin, folic acid), water, rye flour, whole wheat flour, barley, millet, sesame seeds, yeast, sunflower seeds, flaxseeds, soybean oil, rolled oats, rye flakes, sugar, salt, poppy seeds, caraway seeds. 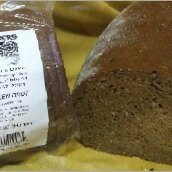 Hearth baked, traditional style Jewish Rye. Available with or without caraway seeds, whichever you prefer. ​Ingredients: Flour (wheat flour, malted barley flour, niacin, reduced iron, thiamin, mono nitrate, riboflavin, folic acid), rye flour, water, salt, yeast, soybean oil, dextrose, caraway seeds. Direct from the city by the way, world famous for street cards and sourdough bread, comes our very own facsimile. Hearth baked and low in sugar, fat, and salt. A lightly flaky crust and subtle flavor give this bread its unique character. 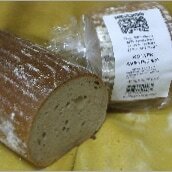 ​Ingredients: Flour (bleached white flour, malted barley flour, potassium bromate), water, salt, soybean oil, sugar, yeast, rye flour. 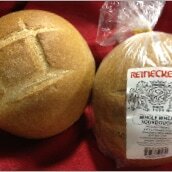 We've combined the best of both worlds - sourdough and whole wheat. Honey sweetened and low in salt. 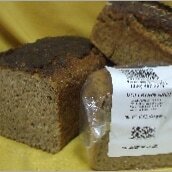 ​Ingredients: Whole wheat flour, flour (wheat flour, malted barley flour, potassium bromate), water, sugar, salt, soybean oil, yeast, rye flour. A delicious hearth baked crusty white bread that is cholesterol free and contains less than 1% salt. 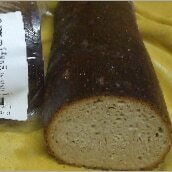 ​Ingredients: Bleached wheat flour (malted barley flour, potassium bromate), water, salt, yeast, soybean oil, dextrose, corn meal. Made from our Vienna bread dough and hearth baked to perfection. 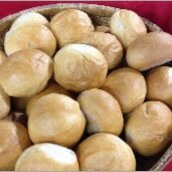 These European style hard rolls are delicious and fresh. Reheated for ten minutes in your own oven. Copyright 2017 Reinecker's Bakery. All Rights Reserved. Designed by EMS Creative.